* Backend Promoter - Strike up affiliate partnerships and promote them through 'Contact Automator'. * Affiliate Updater/Motivator - Inform your affiliate's of your new promotional material and products. Keep them up to date with their affiliate stats and motivate them to make YOU more money! * Membership Site's - Run your membership site through 'Contact Automator', now your members will always know as soon as you add new content. * Download Area - Have your website download area contained within 'Contact Automator' so you can bring people back to your offers long after they download your freebies! $97? $67? Well no, its worth MUCH more than that! But since this is brand new, I have decided to test the water and price this product at just $3.95, not only that, if you're one of the next 50 people to order, you'll get an instant free upgrade to Master Resale Rights! 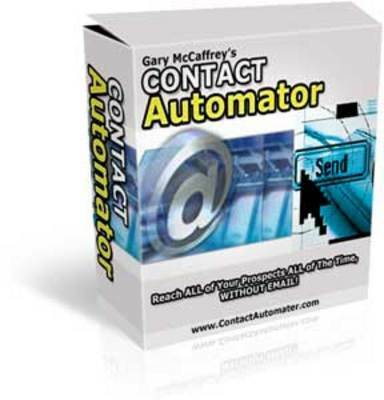 Contact Automator Software automator finder;email broadcast;email broadcast software;email campaign software 87838155 5.95 mystore Fresh Download Available!